Stop sending email. Start sending Official Communications. I saw these official communications on a cute blog called http://www.howaboutorange.blogspot.com/, and I thought they were hilarious. Check out the online Bureau of Communication and send out your own fill-in-the-blank correspondence. 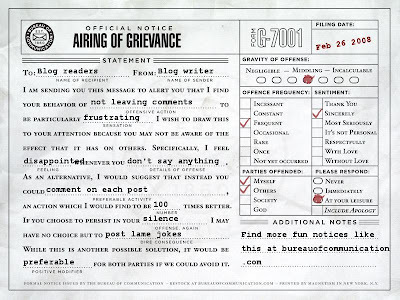 Choose from a variety of forms, including Unsolicited Feedback, Airing of Grievance, Formal Apology, and Acknowledgement of Occasion. FUNNY!! Of course it wasn't speaking to yours truly cuz I always leave you little bread crumbs :-) I hope you rally up some more commenters. Some people just don't get it. That's funny! I like it. I've gotten lots of comments on my last couple of posts, but before that, I went through a dry spell! Now I'm nervous that if I don't post something good, no one will comment! Maybe that's why I haven't posted in a while. Too funny! I love it! I'll be using that site in the future. I love it, its the positive reinforcement, that us as bloggers need to always get reponse. I think it makes us write and share more to give us the feeling that others are on are side of sharing the task of motherhood. I will for sure use this in the future thanks for sharing it.